No, I’m not going that long. Today I’ve got pictures, just two. Usually, the pictures I bring back from jobs are boring and quite inscrutable to people outside of the building science world. Like this one. 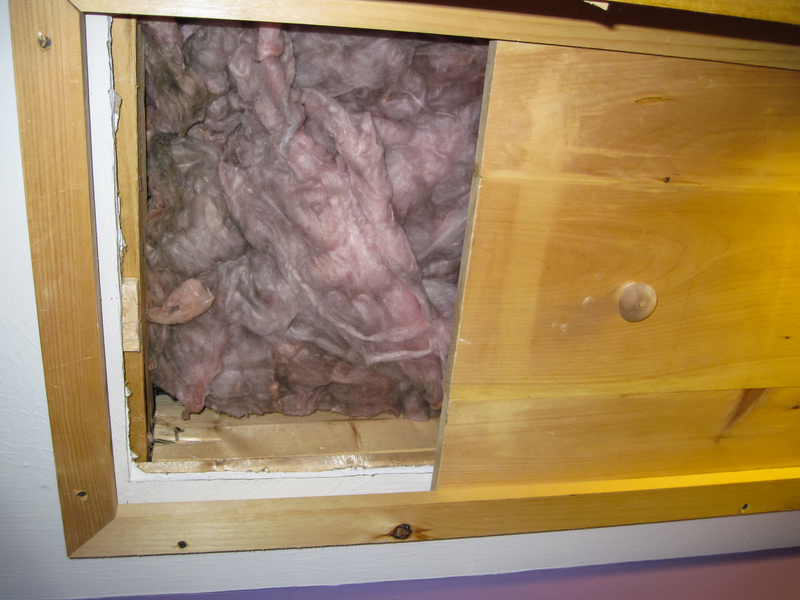 This is just a poor attempt at insulating an attic hatch. I’ll write about it one of these days. I take pictures like this because I’m trying to illustrate something. Usually they show a particular problem, a single fault that occurs when we do something dumb to a building. Today I’ve got one that I think illustrates a fundamental problem that happens during the building process. I call it the “Somebody else’s problem” problem. Someone does something wrong, the next person comes along, and instead of getting it fixed, says, “Not my problem” (NMP and SEP are identical twins) and covers over the problem, making it highly unlikely it will ever get fixed. 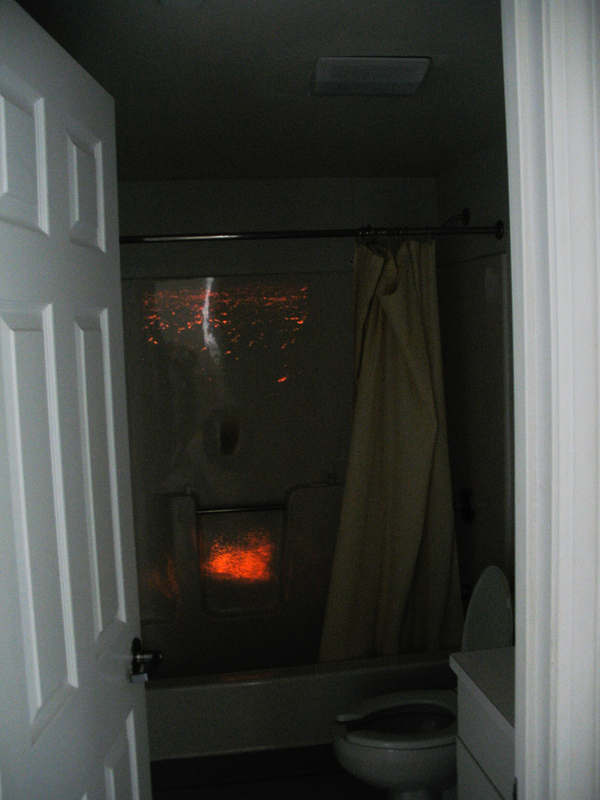 Yep, that’s a glowing bathtub. You’ve always wanted one, I’m sure. And why not? There aren’t that many. I found this one morning doing a walk through inspection for a property management company. This is right off the landing of the second floor. I came up the stairs and stopped. (The glow was more impressive in person). It took a second to figure out what was going on. When I did I bolted down several flights of stairs and across a road to my truck. I didn’t have my camera. Doh! Unfortunately when I came back the glow was fainter (that’s a clue), but I got a half decent picture. So what’s going on? Nope, not a nuclear dump. Although the glow is caused by a nuclear reaction, now that I think about it. Hint: It’s about 9:30 AM and I’m looking east. And I’m seeing sunlight. Someone put the bathtub over a window. Clever, no? How the heck does something stupid like this happen? Well, this is a resort rental condo at one of New Hampshire’s many four season resort towns. When the plans were drawn up 5 bedroom rentals were fairly popular. But the market was changing and the “College Party” rentals were being supplanted by smaller, family-sized units. So a hasty redraw happened during construction (I’m engaging in some informed speculation on some of the details) to make two smaller units. As it happened the new location for the bathtub was where the window was. The window was there, nobody moved it. The plumber showed up to put the tub in, the window was there. The job superintendent was busy with something else. The plumber was under pressure to get everything done. Boom! One bathtub over a window. The Super was under pressure to finish, his boss was under pressure. It was “Somebody Else’s Problem”. Let’s say you want to go skiing. It’s a great sport, but you live a three hour drive from this resort. You book a condo for your family. A nice one. It’s school vacation week. You pay almost $490.00 a night. That’s OK, you deserve a little luxury. After a great day on the slopes you want to shower before heading out for dinner. The bathroom is about 55 degrees even with the heater going full tilt. The tub feels like ice, but don’t worry, there’s no sense in getting into the tub, the pipes are frozen. Congratulations, you are somebody else. This entry was posted in Building Science. Bookmark the permalink. Don’t ever underestimate the venom that can develop on a poorly run job site. I have a feeling the plumber (and everyone else) had been jerked around by changes and inconsiderate management. This is a bit extreme, but I often see signs of job site vengeance. Good and caring management can eliminate most of these stupid problems.